Against earlier information that was cirling on the internet, it seems that the French writer of “À cause de l’automne” is not Jean-Jacques Goldman. He was widely believed to be the author but no hard proof of it existed anywhere, so far. Even at the release of the single no further info was released. All the legal download platforms credits only the original English writer (of “Never Again“), Pete Russell, but the French writer has not been credited anywhere. However, we were able to receive the accurate credits of the song from British “PRS for Music” (the trade name of “Performance Rights Society Ltd.”) website. “PRS for Music” is one of the two big socities in Britain which handles copyright and artist royalties for all the music. The French equivalent for it is SACEM (“Société des auteurs, compositeurs et éditeurs de musique”). For some reason SACEM still does not list “À cause de l’automne” in their database. Although, “PRS for Music” does take care of international business also, so they can handle the royalties collected from France also. 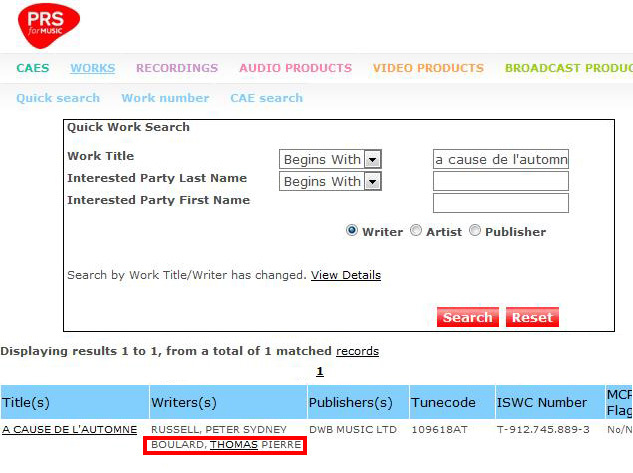 “PRS for Music” lists two writers for the song “À cause de l’automne”. The first one is already known, Pete Russell, who composed the song (and wrote the English lyrics). The second one is Thomas Boulard, member of the French band Luke. So, instead of Jean-Jacques Goldman, it is Thomas Boulard who actually wrote the French lyrics. Alizée herself mentioned Thomas Boulard during her live chat on 27th of June on her official website.